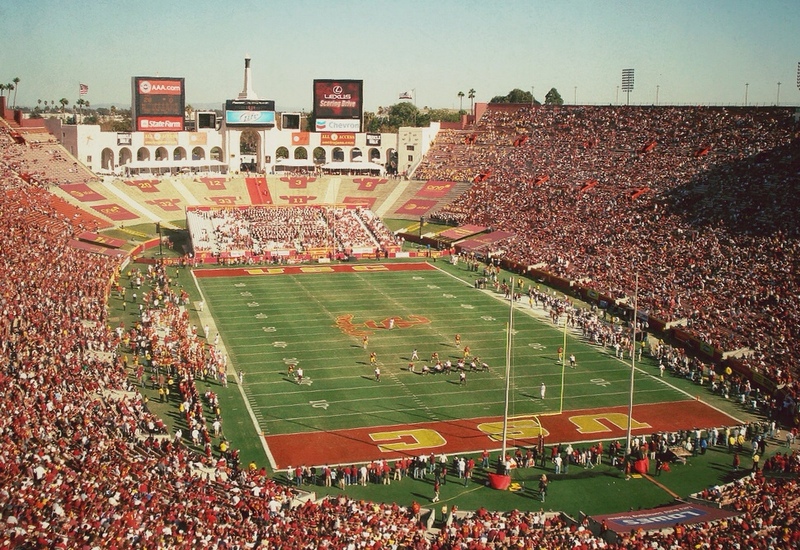 The first USC home game is this Saturday and Metro and USC are hoping lots of potential drivers abandon their cars and take the new Expo Line (via other Metro bus and rail) to this game and others. Not only is it the green way to travel, it will take the pressure off hunting for a parking space since Saturday's game is already sold out. Here's a release from this morning's press event at USC. Steve Lopes, USC Senior Associate Athletic Director, and Metro CEO Art Leahy were joined today by members of the USC Song Girls and the Spirit of Troy band for a pep rally announcing enhanced service to University of Southern California home games this season. The first game — this Saturday, Sept. 1 at the L.A. Memorial Coliseum — is sold out, which means 92,000 fans could be searching for parking. Unless they Go Metro. The morning pep rally at Pardee Plaza on the USC campus celebrated the first season of Expo Line service to Trojan home games. Metro's new Expo Line is the perfect vehicle for getting to the games since two stations — Expo/Vermont and Expo Park/USC — serve the university. And game day enhanced service, which includes “event guides” to answer questions, has been designed to make it easy for fans to avoid traffic and parking hassles while taking Expo to the games. This is the first Trojan season the Expo Line has been open. Service between downtown Los Angeles and La Cienega/Jefferson Station debuted this spring and was extended to Culver City this summer. Although the line has been in service for less than six months, it already carries more than 18,000 daily boardings. Before and after the games additional trains will be added to the Expo Line, as well as to the Red, Purple and Gold lines to make transfer connections efficient and to accommodate increased passenger loads. The Metro Silver Line, which stops nearby at 37th Street/USC Station, also will have increased service. The Silver Line is Metro's limited-stop service connecting the South Bay and San Gabriel Valley to downtown Los Angeles. It runs between Artesia Transit Center and El Monte Station via the Harbor Transitway on the Harbor Freeway and the El Monte busway on the San Bernardino Freeway. Passengers traveling to the games are advised to purchase $5 Metro Day Passes at the station where they are starting out. That will be all they need for the day. Those starting on the Expo Line should load two one-way fares onto their TAP cards to avoid having to stand in line at ticket vending machines after the game. Although Metrolink train service stops late afternoon on Saturdays, Amtrak service continues to Orange and Ventura counties and Metrolink monthly pass holders can use their passes on Amtrak trains between the same station pairs for free. For details go to the Metrolink website. To find out how to get to the games via Metro, consult the Metro Trip Planner at metro.net. Actually, three stops serve the university, and Jefferson/USC could be better if you’re planning on tailgating on the north part of campus. Two stops serve the Coliseum. It’s too bad we can’t get a Metrolink special train or two for this! Metrolink is fine for people on the AV or San Bernardino lines, with the 11:30 train on the SB line and the 8:55 p.m. train on the AV line. It’s going to be an open question how well the Silver Line does, though, to get those people home afterwards. That’s a long cab ride back to Lancaster if the 4:30 start runs long. At least the 11:30 train provides options back into the Inland Empire.